Vivo’s “Waterdrop” Phone Launching on January 24 - Playfuldroid! Vivo has confirmed through its Weibo account the future of the mobile phone will be announced on Jan. 24. 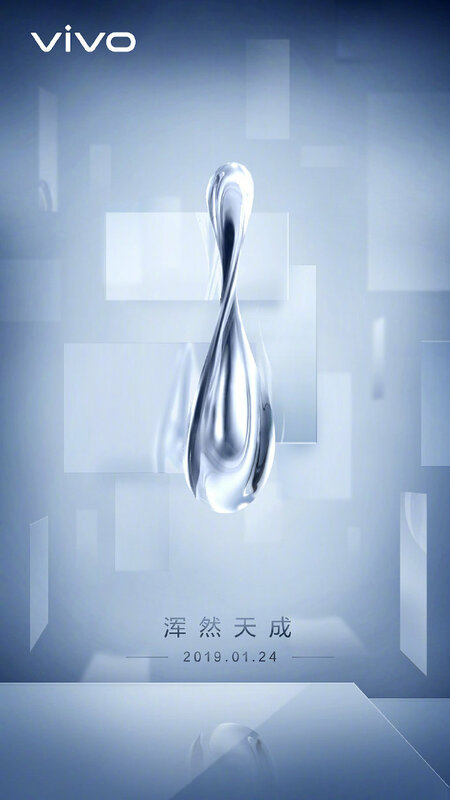 It appears that the company could be launching a new concept phone that is codenamed as “Waterdrop” on the said date. At the beginning of the last year, Vivo had unveiled the Vivo APEX concept phone that came with amazing notch-less display, in-screen fingerprint scanner and pop-up selfie. Later on, the smartphone was made official in China as the Vivo NEX phone in March. The same phone was brought to various markets outside of China in the next few months. The “Waterdrop” smartphone could be yet another concept phone from the company. Recently leaked images of the phone that were shared by leakster with IceUniverse Twitter account had revealed that it will be sporting an elegant design. It is speculated that the phone may feature any button or ports. Probably, after getting announced on Jan. 24, the company may showcase it at the Mobile World Congress (MWC) tech expo that will be held in Barcelona, Spain in the coming month. There is no information available on the specifications of the smartphone. After the Lenovo Z5 Pro GT phone that was announced in December last year, the Vivo Waterdrop phone could be the second phone to feature Snapdragon 855 chipset.